The Orange Micro Terror takes Orange's world renowned vintage British tube tone, and packs it into their smallest package yet. Having already rocked the world with the 'Tiny' range of Terror amps, they have done it again with the Micro Terror - a micro 20W amp with enough bark and bite to convincingly power an 8 or 16 ohm 4x12 cab! An ECC83/12AX7 preamp valve gives the Orange Micro Terror it's classic valve warmth, and it has a solid state power section. These industry standard tubes really rock, and with the lower than usual wattage Micro Terror is particularly good for recording when fully cranked, producing a creamy smooth distortion that could give much bigger amps a serious run for their money, and a lot more character than most solid state amps. The controls are simple - Volume, Tone and Gain - if you want further colour your tone you can of course plug in additional pedals and effects, but there is something beautiful about the un-adulterated tube tone, it is definitely worth plugging directly in when you first use it. Despite being the smallest amp in the Terror family, it is still built to the same rugged specifications with a high tensile steel case and superior Orange build quality. At less than a kilo it is amazingly portable, a session guitarist could be forgiven for carrying this around in there car for any last minute opportunities. This is an amazing amp to have in a studio or home/practice room, it offers unbelievable value for money. This quality of hybrid tube amp, at this price has been something of a budding guitarists dream for some years, and now it is a reality! Posted on 27/05/2016 by ktog I bought one of these after hearing it on a video putting a rig together for under £500. I play it through a 1x12 cab, which was formally part of an Ashdown bass combo, the amp of which is now defunct. The sound is pretty massive at all volumes, and the amp certainly packs a LOT of oomph for 20W. My 'goto' guitar is a Telecaster fitted with Seymour Duncan Hotrails pickups, and the amp sounds great on both single coil and full on humbucker settings. I have a 50W Marshall, but prefer using the Orange, not the least due to its lack of weight. My only real criticism is that it's SO light in weight that it can easily be pulled off the top of the cab! Posted on 29/06/2012 by murray Orange have come up trumps once again, cramming the monster sound of a vintage Orange head into the new valve/transistor hybrid Micro Terror head. The valve pre-amp gives you all the classic sounds you require - massive cleans, crunching blues and heavy, driven rhythms, pumped out through the transistorized power stage, all slotted nicely into a rugged die-cast metal head that fits in your leads bag! The aux input allows you to jam along with your favourite tracks from your ipod and the very useful headphone socket allows you classic tones without annoying the neighbours. The Micro Terror truly astounds when the speaker out socket is plugged into a 4x12", which makes it ideal for studio, live rehearsal and even the local pub gig. Sound engineers will be back on your Christmas card list as the MT allows you big gig sounds at mixable levels. At 0.85kg, its smaller than a bag of sugar, at £99, it's fantastic value for money... neither your wallet or your back need take the strain in exchange for a classic guitar sound! Posted on 08/06/2012 by Jackieboy This cute-looking quintessentially British piece of work gets much praises on the hipster style front and those looking for something alternative, as does the rest of the Orange range, but what is it actually like? For what it is, it's fairly good. I'm not going into how much it costs because I tried one for a week for free when looking after it for a friend moving house, and think price is irrelevant anyway. You buy what you like. Anyway, the sound you get is what you'd expect, you're never going to get that full blooded tube sound from something this small, no matter what your setup. 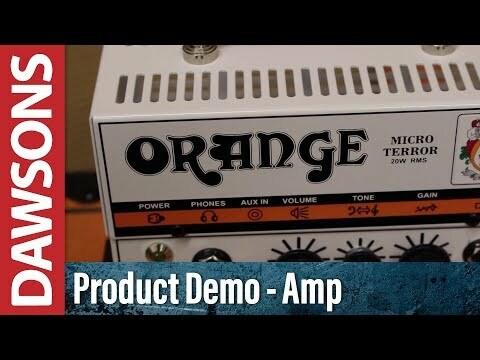 It sounds like it has been made to sound like a bigger Orange amp, which it does better than a lot of its competitors (I'm looking at Marshall, Vox and Fender 30w and less). With other smaller versions of big amps, you get something irritating beyond belief and big heap of expensive disappointment. This is a bit different, it's ballsy, but needs a damn good cab and at least one FX pedal to sound right. I played through it with my Gibson Flying V with great success, both clean and at the edge, but when I tried my Peavey Wolfgang I was a bit disappointed, same with my Strat. Overall though, it’s good little amp, despite the price. Posted on 06/06/2012 by Miles. Proper practical item, great for gigs and even bedroom practices. Seriously would recommend this, even though I don't own one myself.